No time or energy to write today as I’m in the middle of several different projects with deadlines looming. 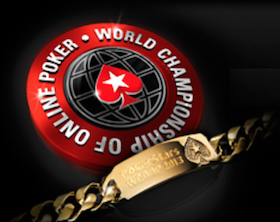 Just wanted to mention briefly -- and with a due measure of awe -- how crazy it is again to think of how friggin’ big the World Championship of Online Poker continues to be on PokerStars. For the first three years after Black Friday I kept writing here about the WCOOPs doing just fine without the U.S. players, holding steady and then increasing in numbers from 2011-2013. It’s been another huge series again this year, with the $5,200 Main Event drawing an amazing 2,142 players to create a $10,710,000 prize pool. Just think of how few live tournaments build such a prize pool during the course of the year. Still amazing to consider, even from this distance.